In the Yenidze, harmonic contrasts collide together to create its unique character – an oriental architecture in an otherwise Baroque environment. It combines both Islamic and European style architectural elements whilst exhibiting both a workplace and a recreational/ leisure culture. It is outside mosque and inside office building. The construction, originally inspired by oriental architecture in 1909, served as an advertising platform for the oriental tobacco and cigarette factory owned by the manufacturer and builder Hugo Zietz. While cigarette manufacturing stretched over five floors, relaxation and recreational areas for the workers could be found in the glazed dome of the building. Prior to the war, an illuminated sign saying “Salem Aleikum” – may peace be with you – would greet passing train passengers. 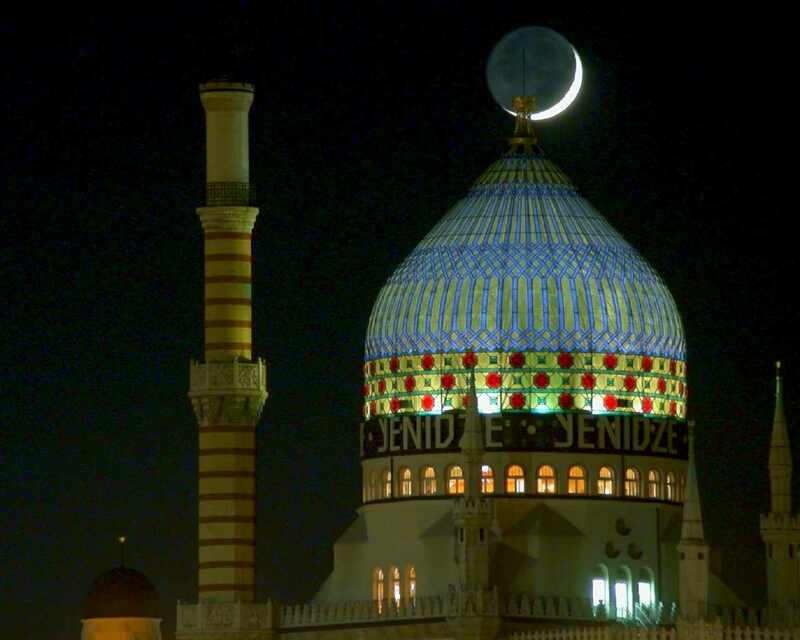 The Yenidze is not a rigid copy of a real mosque: its architecture combines art nouveau with Moorish elements. From the outset, the entrance portal, with its Arabic shapes such as the pillars and masonry, gets visitors in the right mood for the prestigious interior of the Yenidze. The entrance hall itself exhibits mainly red and grey granite. The front of the building, designed in the style of art nouveau, consists of granite, colourful concrete building blocks, bricks and painted plaster. It displays rich ornaments and is decorated with colourful mosaic inlays made from special tiles and red-white bands of artificial sandstone. Due to its unique architecture, the Yenidze is very recognisable and, thanks to its central location, has become a popular office location for companies and organisations. The architect Martin Hammitzsch constructed the Yenidze in 1909. Back then, in central Dresden, building factory premises which were easily identifiable was prohibited. Therefore, the businessman and project initiator Hugo Zietz, who was fascinated by the Orient, came up with the idea of giving the Yenidze its distinctive design and consequently had it designed in the style of a mosque. Its architectural role model was the Tombs of The Mamluk in Cairo. Not only was its oriental architecture spectacular, but also the construction method: it was one of the first industrial buildings that was built using a ferroconcrete frame construction method. For this purpose, the skeleton of the building was put together using individual elements such as cover panels, supports and foundations, which all have supportive function. Subsequently, the raw skeleton was gradually equipped with a façade. This method not only allows for a flexible room layout, fire protection, but also enhances feasibility, as it did not require interior bracings. The Yenidze has a full basement, five floors and possesses a full storey constructed as a mansard roof. With an overall height of 62 meters, it tops all mosques in Germany. Another feature is its chimney masked as a minaret. The characteristic, ogival dome is 20 meters tall and glazed using emerald green and ruby-coloured glass. Its interior is illuminated in the dark. Hugo Zietz was a purveyor to the Saxon Court, which was an honour associated with high-quality products. The golden tip, which still embellishes the dome to this day, is an indication of this honour. The silhouette belonging to the “tobacco mosque”, along with the architecture of the characteristic dome and minaret, is a scarcity in Eastern Germany. Both Leipzig and Dresden host one larger mosque, however, in the States of Thuringia and Saxony-Anhalt, there are no comparable buildings. Yenidze at nightAt night, the dome is illuminated from inside.